A few weeks ago I shared with you how much I adore my friend's guest bath. Today I'd like to share the guest bedroom that adjoins that gorgeous bath. The first moment I stepped into this room I was just in awe of the fantastic pieces she has in there. This corner is quite possibly my fav in her entire home. The antique needle point that hangs over the chest is a real beauty. Notice the shaving mirror and the contents that adorn it...LOVE! Ya'll know I love the Staffordshire pieces along with the oil paintings on the wall! This antique dressing table is such a treasure! It fits perfectly into this spot in the guest room. No dressing table would be complete without a silver hairbrush/comb and mirror set for sure! This room is nothing short of perfection! It truly has it all(at least for me) toile, needlepoint pillows ,Staffordshire and antiques!!! Notice the shields that are in the windows, I LOVE! A big thanks to my friend for letting me invade her home so I could share this amazing room! STUNNING!!! I love everything about this room! So pretty! Love all of the found pieces, and the thought she's obviously put into staging it all! BEAUTIFUL room! She is fortunate to have all these antique pieces! What lovely antiques! This is such a welcoming room that any guest would love! Gorgeous! 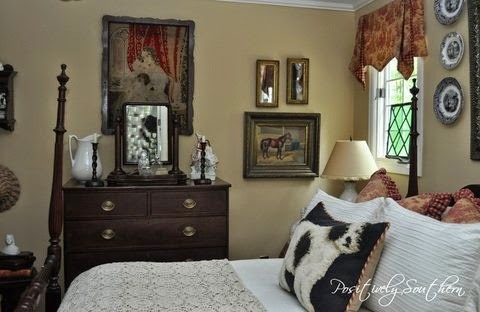 I love this style of room; so much nicer (and with a lot more character) than those neutral 'Pottery Barn' style rooms! (Though those are nice, too.) Mostly, I just have a mess at mine.